This vegan millet bowl is full of plant-based goodness, with delicious roasted vegetables and a mouthwatering jalapeño tahini dressing! This recipe was created in collaboration with Bob’s Red Mill, a brand that I trust and use in my own kitchen. All opinions are my own, and I hope you love this vegan millet bowl! Hi folks!! I’m back after a week hiatus to bring you a DELISH new recipe out of my brand new kitchen. My fiancé and I just moved, and this is my first recipe post from here! Today I made this vegan millet bowl that really speaks to my own taste and preference. 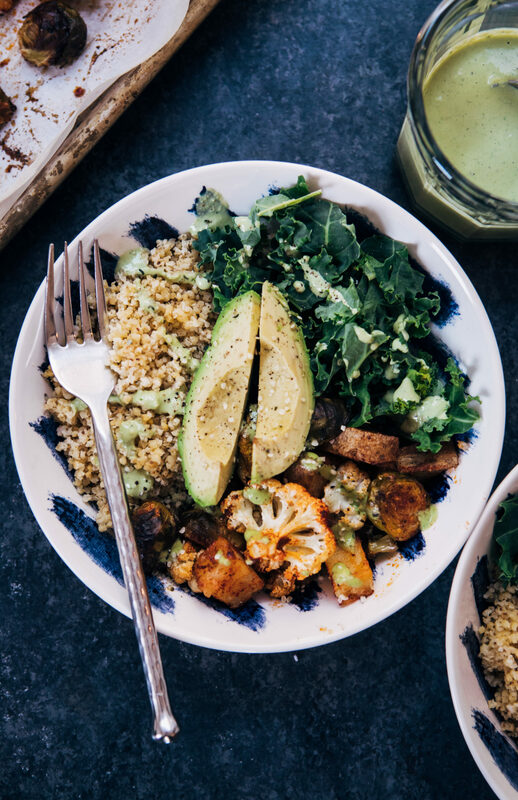 My favorite thing in the world to eat is a buddha bowl, and this recipe checks all my boxes – a grain, some veggies, avocado (of course), and a killer dressing that ties it all together. For this recipe I used Bob’s Red Mill millet, which came out perfectly fluffy and al dente! I’ve been using Bob’s Red Mill products in my kitchen for years, so when they asked me if I’d like to work with them in 2019, it was a huge YOU BET!! ;) They use high-quality whole grains that can be used for vegan, paleo, or even gluten-free cooking and baking. 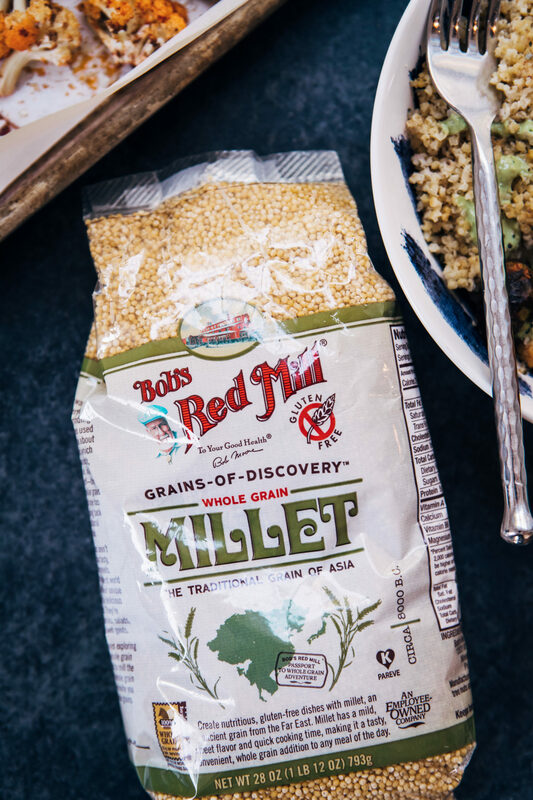 It means a lot to me to work with products in my kitchen that I know will work out every time, and this millet didn’t disappoint. I’m really glad to start off my time in this new house on this note, creating a delicious recipe with a brand that I love and trust. I already feel like a completely different person in this new house. I’ve talked about this on my blog before, but I had a really rough year this past year (and that’s saying A LOT for me). And living where we had lived in the city really set me back in a lot of ways. 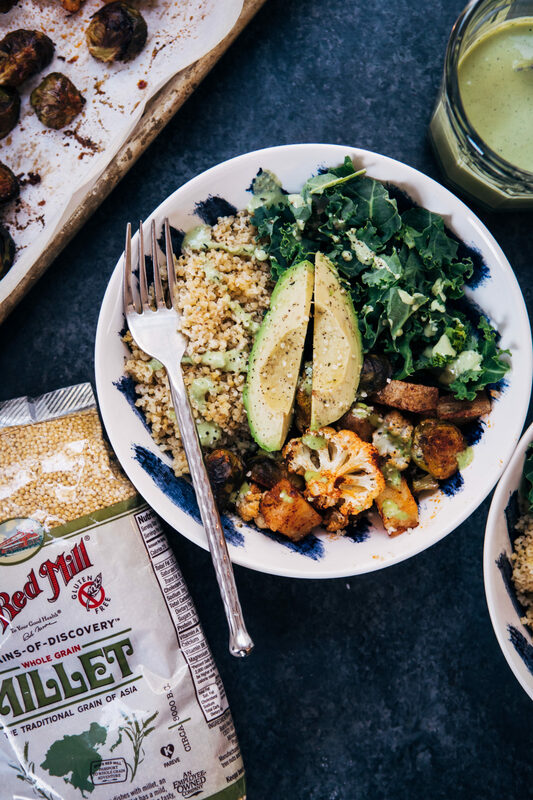 This vegan millet bowl is full of plant-based goodness, with delicious roasted vegetables and a mouthwatering jalapeño tahini dressing. This recipe makes 2-3 large bowls. Then, bring the water, millet, and a pinch of salt to boil in a pot on the stove. Reduce heat to low, and simmer 20-25 minutes or until millet is al dente. When done, fluff with a fork and set aside. First, prep your vegetables - cut the 1/2 cauliflower into florets, cut the brussels sprouts in half, and cut the russet potato into 3/4-inch pieces. Lay veggies out on a baking sheet lined with parchment paper and add on a small drizzle of olive oil. Then, add on the salt and spices, and mix with your hands until vegetables are evenly coated. Bake veggies in the oven for 30-35 minutes. While veggies are roasting, make the dressing. First, cut the jalapeño in half and remove the ribs and seeds. Then, add all dressing ingredients into a blender and blend on high until smooth and creamy. Assemble your bowls - add on a layer each of kale, millet, and the roasted veggies. Drizzle with as much of the dressing as you like. Serve with avocado and hemp seeds, if desired. Millet is the best — it is one of the original superfoods, together with avocado, and it was praised long before kale and quinoa got their publicity ;) I really love millet but it seems nowadays it doesn’t get the attention it deserves. This millet bowl sounds amazing, especially with that jalapeño dressing! Congratulations on your new place Sarah! Settling in a new home and creating a new space with the one you love feels so grounding. You know I’m a fan of Bob’s, so I love this partnership! I love millet too… but I forget about it. Thank you for inspiring me – and I’m totally lovin that jalapeno tahini! (droooool! ).